Very bright and goes well with so many different color options. Looks great in my spare bedroom and added just the right amount of color I was looking for. 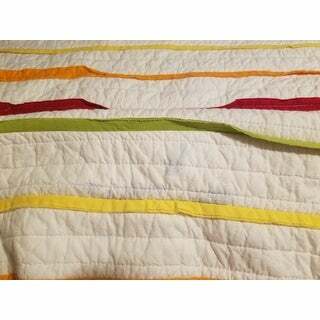 Bring a little bit of color and brightness to your room with this reversible quilt and its matching pillow shams. 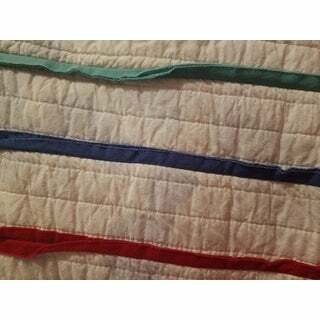 It is channel-quilted and has sewn-on stripes in rainbow hues of red, blue, yellow, orange, red, green, and turquoise. 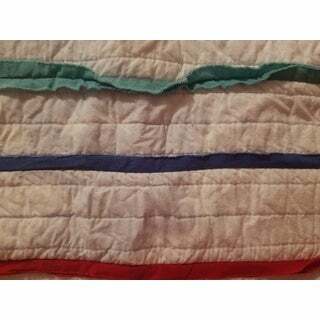 You can take it back a few hues and turn it over to find a solid blue color with white quilting. The pillow sham also features coordinating sewn-on stripes in the same hues making for the ultimate complement to either side of the quilt. Made from 100-percent cotton, the quilt holds a 100-percent polyester fill that is free to wash in the machine with cold water and a cup of white vinegar. To ensure vibrancy, don't use detergent during the first cycle. Strategically crafted for your convenience, it is safe to dry with the tumble dry setting on low with a dry bath towel for fluff maintenance. Let yourself wake up each morning to bright and welcoming colors with this quilt and its matching shams. This is a great quilt - I'm really happy with the colors and the striping. It's a perfectly fun switch-up in bedding, especially for our LGBTQIA+ household. 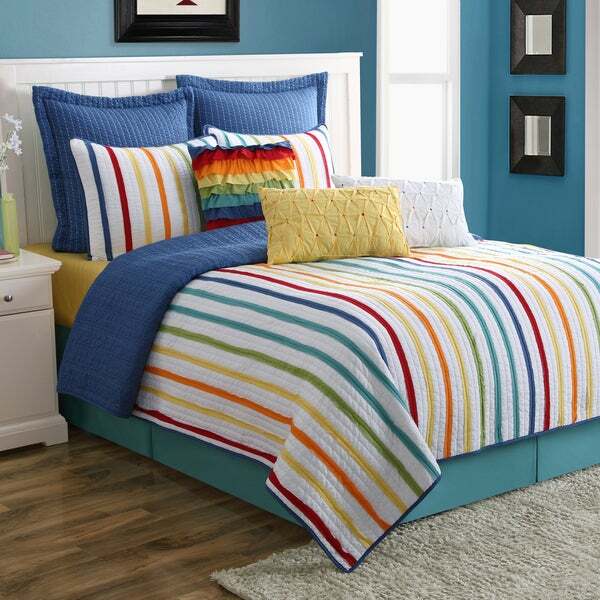 Just a little pride-ful bedding to brighten the room. Very disappointed in this product. After washing 1 time and taking straight from the washer to the dryer I noticed bleeding from the dark blue stripe onto the white background of the quilt. I would try to send it back but have already received the sheet set and curtains that match as gifts. I love Fiestaware dishes and was excited to move the beautiful colors into other rooms but not going to be buying anymore Fiesta bedroom pieces after this one. NICE COLOR BUT BLEEDS. I AM VERY VERY DISAPPOINTED WITH THIS QUILT. I COULD HAVE WRITTEN A REVIEW SINCE BUT I DIDN'T. I HAVE TOO MANY QUILTS AND I JUST USED IT AND WASHED IT A FEW DAYS AGO. IT BLED A LOT INTO OTHER COLORS. Really great quality stitching and cotton. It’s soft and washes really well. Great weigh to it for all weather/seasons. I love the gender neutrality of it. I bought it for my son but it would also look great in a guest room. We bought this for our 2 year old as he transitioned from crib to a full size bed. I LOVE this quilt! So pretty in my grandkids guest room. Very soft and washes nicely. I paired it with a star pattern quilt in blue. Looks so bright and cheerful. Looks nice. Colors look like picture. Bright and colorful, very well made. It is beautiful Looks like summer! Thanks! "Is there made by HOMER LAUGHLIN WHO IS KNOW FOR HIS FIESTA DINNERWARE?"